Welcome to my website. My name is Prof. Rob P.A. Janssen MD PhD. I am an orthopaedic surgeon specialized in disorders of the knee. 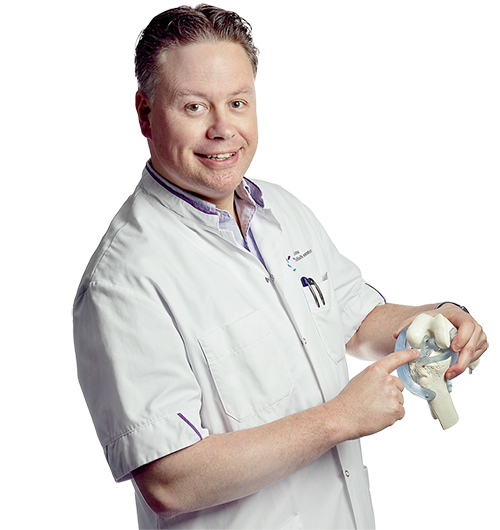 My private knee practice is located at the Orthopaedic Center Máxima Eindhoven / Veldhoven, The Netherlands. Orthopaedic Center Máxima is a tertiary referral center for knee ligament injuries in the Netherlands (STZ Center of Expertise). I am a knee specialist and treat (high level) sports injuries, traumatic disorders, meniscus and cruciate ligament lesions, multi-ligament injuries, cartilage disorders and osteoarthritis of the knee. I am a knee consultant dor the Royal Dutch Football Association (KNVB). I am chair and Professor Value-Based Health Care at Fontys University of Applied Sciences Eindhoven, The Netherlands. This website is meant for anyone interested in knee disorders with news items, information on various knee disorders, personal stories in patient cases, rehabilitation protocols, my scientific work and biography. My social media will provide you with the latest scientific developments about the knee.